Who needs Amazon? Pittsburgh’s transformation into a serious player in the information age is accelerating from within. That was the message at the University of Pittsburgh Innovation Institute’s 13th Annual Celebration of Innovation at Alumni Hall Monday evening. The event celebrated Pitt innovators, who set cords for the number of technologies licensed from the university in fiscal 2018 (162), as well as the number of startup companies formed from those technologies (23). Special awards were also given to faculty and student innovators of the year and an award for the Innovation Institute’s mentor of they year. See all photos here from the 2018 Celebration of Innovation. 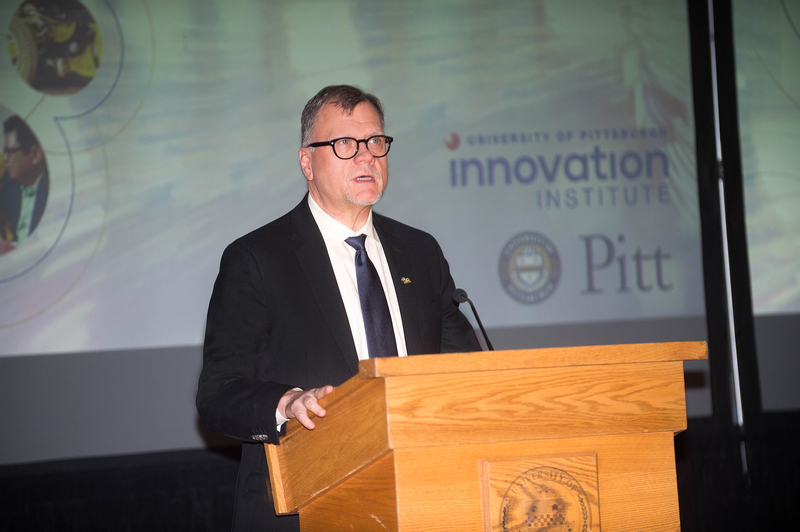 Rob Rutenbar, Senior Vice Chancellor for Research spoke about Pitt’s impact at the 2018 Celebration of Innovation at the University of Pittsburgh Monday night, December 4. The event honors Pitt innovators who have submitted an invention disclosure, created a patent, or had their technology licensed. Rutenbar pointed to Pitt’s recent progress in translating discoveries from the lab to the market as an indicator that Pittsburgh is growing its niche in those areas.He also pointed to the growth of the “Innovation District” around the Pitt and CMU campuses, where in an area of less than two square miles accounts for more than a third of Pennsylvania’s university research output. He said the innovation district is getting a huge boost in the life sciences from the university and UPMC in the next few years with the investment of $200 million by UPMC into the Immune Transplant and Therapy Center (ITTC), for which Pitt is renovating a former car manufacturing building on Baum Boulevard to house the new center to house research labs, incubator space and space for industry partners. Additionally, UPMC is investing $2.2 billion it is investing in the creation of three new specialty hospitals for cancer treatment, heart and transplant care, and vision restoration. To address the report issued by the Brookings Institution last year on Pittsburgh’s rise as a global innovation city, which called for stronger support mechanisms around academic entrepreneurs, Pitt’s Deitrich Stephan established life science startup incubator LifeX Ventures, which is currently raising a significant early stage investment round. “Tonight we are celebrating those Pitt faculty, staff, students who are growing our innovation and entrepreneurship ecosystem from within; who are pushing the boundaries of scientific discovery and then asking how those discoveries might benefit the world by being translated into products and services that improve our lives while also creating economic opportunity,” Rutenbar said. This award, now in its third year, is a “lifetime achievement” award that recognizes a faculty member who has demonstrated a commitment to innovation commercialization. Dr. Badylak is a pioneer in the field of extracellular matrixes, which are used for tissue regeneration to treat a variety of diseases and conditions. He is among the University’s all-time leaders in disclosures filed, patents issued and licenses executed. His new company, ECM Therapeutics, for which he is the Chief Scientific Officer, was one of the record 23 startups that spun out of Pitt last year. 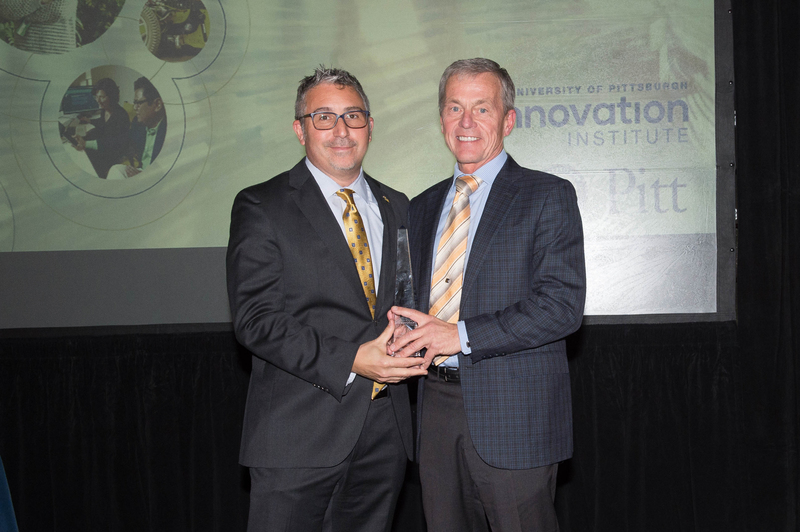 Dr. Stephen Badylak, Professor of Surgery, Deputy Director of the McGowan Institute for Regenerative Medicine, was presented the Marlin Mickle Outstanding Innovator of the Year Award at Pitt’s 2018 Celebration of Innovation. This new award recognizes a faculty member that has not been active long enough to be among the University’s all-time statistical leaders in commercialization activity, but has demonstrated a passion for innovation commercialization through participation in Innovation Institute and other university education and mentoring programs and competitions. The inaugural recipient is Maliha Zahid, assistant professor in the Department of Developmental Biology. Dr. Zahid has led two projects that have both secured $100,000 prizes in the Pitt Innovation Challenge (PInCh) competition, Cardiac Targeting Peptide in 2016 and LungHealth-E this year. She has gone through our First Gear Program and is currently completing the national I-Corps program. She has also completed the Coulter Translational Partners II Program. 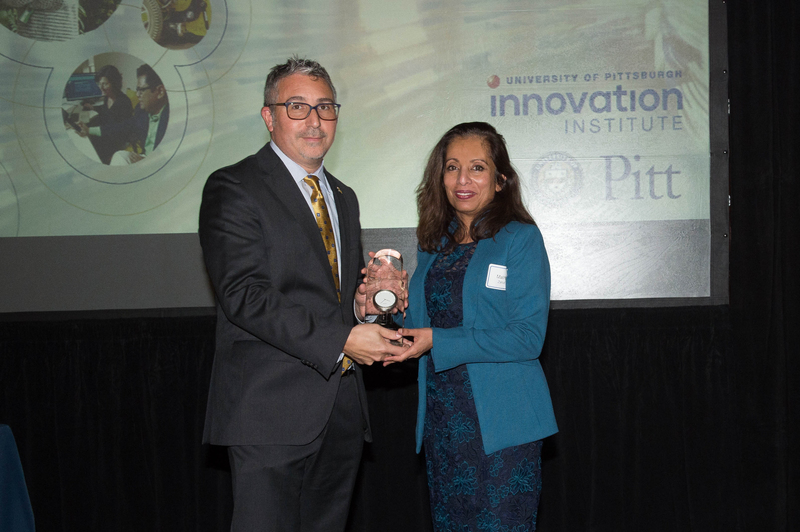 Dr. Mahila Zahid, assistant professor in the Department of Developmental Biology at the University of Pittsburgh is presented with the Emerging Innovator award by Evan Facher, Director of the Innovation Institute and Vice Chancellor for Innovation & Entrepreneurship. 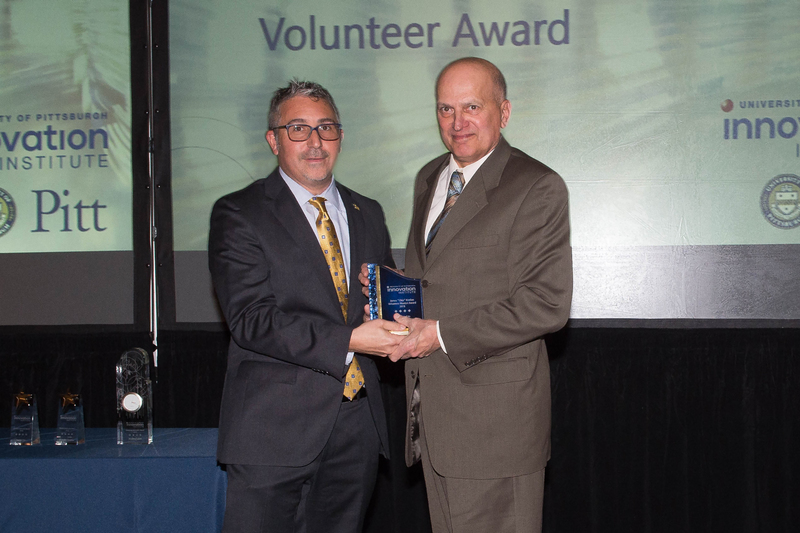 James “Chip” Hanlon Volunteer Mentor Award: Robert Huemmrich This is the second year for the James “Chip” Hanlon Volunteer Mentor Award, created to recognize those individuals who give their time to help Pitt innovation teams navigate the commercialization process. Mr. Huemmrich is a retired engineer who served for nine years as director of a technology incubator at Clarion University and was a founding member of Western PA Adventure Capital Fund. He has mentored seven teams in the First Gear program, six in the Fourth Gear program, which includes teams external to Pitt in partnership with BlueTree Allied Angels and the Institute for Entrepreneurial Excellence. The James “Chip” Hanlon Volunteer Mentor Award was awarded to Robert Huemmrich, First Gear & Fourth Gear mentor & ’86 Pitt alumnus. Four Growers was this year’s winner of the Randall Family Big Idea Competition. The team also captured second place in the ACC InVenture Prize Competition and became Pitt’s first team to compete in the Rice Business Plan Competition. They recently participated in Y-Combinator, in Silicon Valley, which is considered by many as the world’s most prestigious startup accelerator. The founders are now raising an investment round as they aim to have their initial product for robotic greenhouse produce harvesting on the market by late 2019. 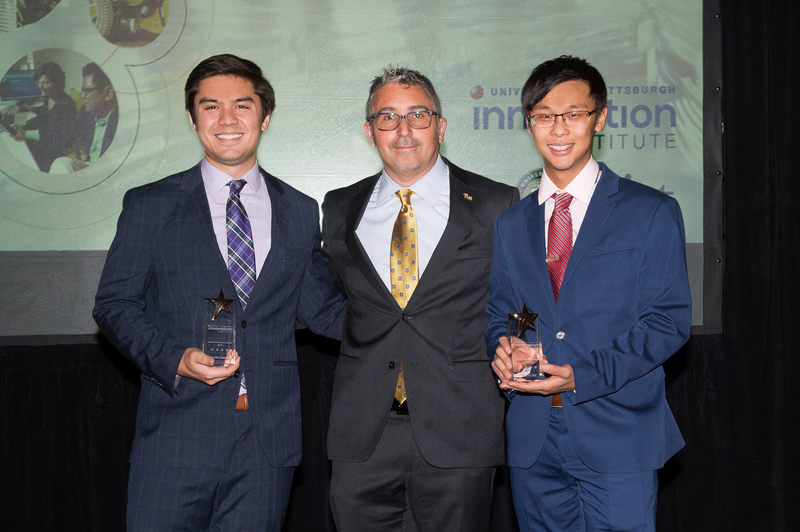 The Student Innovator Award: was presented to Four Growers, Brandon Contino, Electrical Engineering Alumnus and Daniel Chi, Mechanical Engineering Alumnus by Evan Facher, Director of the Innovation Institute & the Vice Chancellor for Innovation & Entrepreneurship at the University of Pittsburgh.